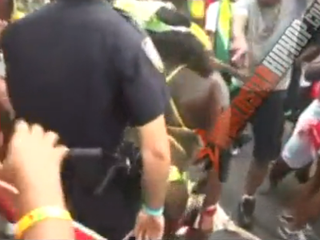 An investigation is under way into a video that depicts NYPD officers "grinding" on scantily clad female parade goers at this year's West Indian Day Parade in Brooklyn, the Daily News Reports. A "source familiar with the paper" said that while it doesn't constitute corruption, it still "looks bad." Quite frankly, this is just about the most positive cellphone video of law-enforcement interaction with the black community we've seen in some time. Let us know what you think. Read more at the Daily News and Mediabistro. In other news: Cherokee Nation to Feds: Kick Rocks on Black Vote.